Fine weather towards the end of last week lured me away from my computer screen and out to Weardale on the flimsiest of pretexts, and gave me an opportunity to drag this blog away from musing about pandas and Taoism and back to its core business. Forty minutes drive from home brings me to Frosterley, in the historic mining and quarrying areas of the valley, though enough time has elapsed for the hard edges of the industrial heritage to have been rubbed away by the gradual incursions of nature. It is a beautiful spot, with the river meandering down a tree-lined channel with wildlife in profusion. Understanding a river is partly about recognising patterns at different scales and just as one can look at a landscape such as the one above and infer something about its conditions (fast-flowing water? relatively natural channel? low population density?) so a naturalist should be able to adjust his or her focus and read the story of the river at smaller and smaller scales. It takes a few moments to adjust – physically and mentally – to searching at these finer scales, but the story of the river started to open up once I looked more closely. There were a number of small dark green patches on the river bed, most noticeable towards the margins (maybe because my wellingtons limited my explorations to the shallower parts of the channel). They were slimy to the touch and I could make a guess at their identity, but needed to get them under a microscope before I could confirm this. That’s one of the problems with my kind of natural history: there is none of the immediacy that a birdwatcher or field botanist gets from putting a name onto organisms in the field. Underneath the microscope, however, my alga yielded up its secrets: I could see narrow filaments composed of cells each with a single chloroplast lapped around most of the perimeter, with a number of side branches, each gradually tapering to an acute apex. 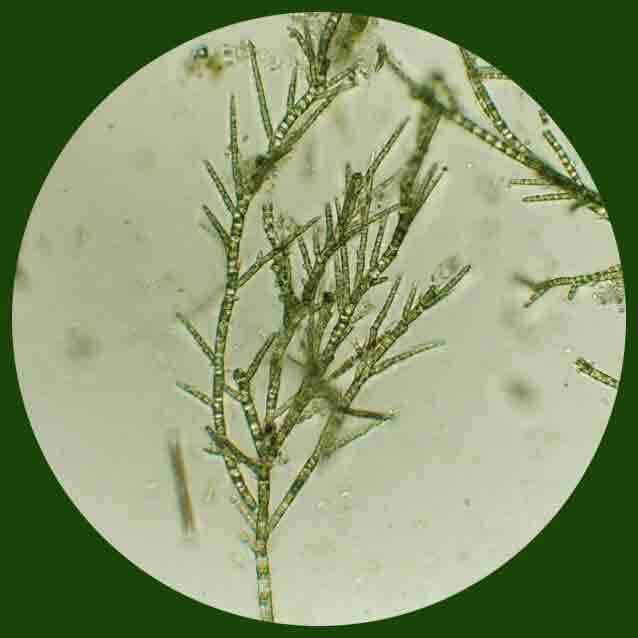 This is Stigeoclonium tenue, a common alga of streams and rivers although possibly less common now than was the case a couple of decades ago. It is hard to be sure because it is easily overlooked and there is no systematic recording of these organisms, but I am not the only person to voice this suspicion. Stigeoclonium tenue from the River Wear at Frosterley. Left: macroscopic view showing tufts of green filaments attached to a submerged stone (scale bar: approximately 1 centimetre); right: microscopic view (scale bar: 10 micrometres = 1/100th of a millimetre). Looking at these filaments, I can read a little more about the state of the river than I could infer from my landscape-scale perspective at the top of this post. I can suggest to you that this river is, or has been in the recent past, flush with the nutrients that Stigeoclonium and other plants need to thrive. Why do I know this? I shared laboratory space as a PhD student with a colleague, Martin Gibson, who was investigating the physiology of this species and its relatives. This built on earlier work by Brian Whitton and others which showed that when nutrients were scarce, the branches of Stigeoclonium were much longer, tapering gradually into fine, elongated cells that were devoid of chloroplasts. These had special enzymes which were able to break down organic compounds that contained the phosphorus that the alga needed. When nutrients were plentiful, these hairs disappeared. I strongly suspect that, were I to look at recent phosphorus measurements in this part of the Wear, they would indicate low concentrations, which might suggest that my inference is wrong. However, the Environment Agency’s standard approach to measuring water chemistry is based on a single visit each month and we know, from finer-scale studies, that phosphorus concentrations can vary greatly over short periods of time (particularly related to changes in the weather and flow regime). We also know that their standard analytical method does not record phosphorus that is tightly bound into molecules. 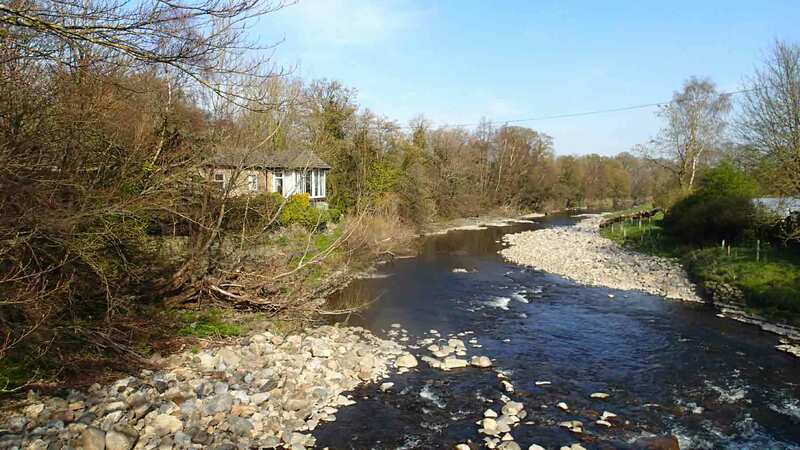 The Environment Agency’s approach is good enough to give the basic insights into rivers that they need to regulate the environment, but misses many of the nuances. That’s why an understanding of the ecology of apparently insignificant organisms can be so useful to river managers. Stigeoclonium from the River Wear at Frosterley, photographed at 100x magnification. Gibson, M.T. and Whitton, B.A. (1987). Hairs, phosphatase activity and environmental chemistry in Stigeoclonium, Chaetophora and Draparnaldia (Chaetophorales). British Phycological Journal 22, 11-22. Gibson, M.T. and Whitton, B.A. (1987). Influence of phosphorus on morphology and physiology of freshwater Chaetophora, Draparnaldia and Stigeoclonium (Chaetophorales, Chlorophyta). Phycologia 26: 59-69. Whitton, B.A. & Harding J.P.C. (1978). Influence of nutrient deficiency on hair formation in Stigeoclonium. British Phycological Journal 13: 65-68. This entry was posted in Uncategorized and tagged algae, ecology, phosphorus, River Wear, Stigeoclonium. Bookmark the permalink.